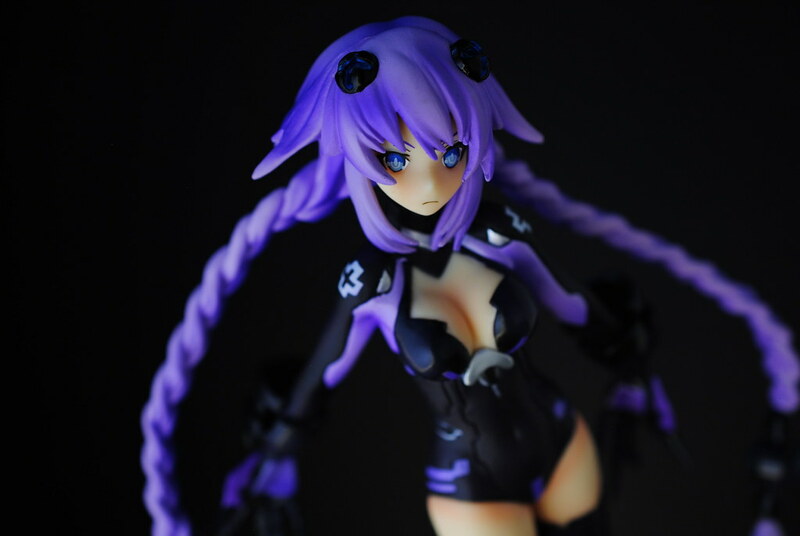 ques Q Purple Heart - Hypersexualized young girls inside! Every once in awhile I come across a game, a game with such an amazing and clever premise that instantly grabs my attention. I sit and can’t help but think, how come no one thought of this before? Hyperdimension Neptunia is one such game, when I first read about it I was hoping for a localization and sure enough Nippon Ichi Software of America delivered and the game was released in English. What premise does this game hold you might ask? The anthropomorphization of the current generation console wars. You got four different countries along with four goddesses each being a representation for one of the three current generation consoles the Wii, PS3 and Xbox 360. 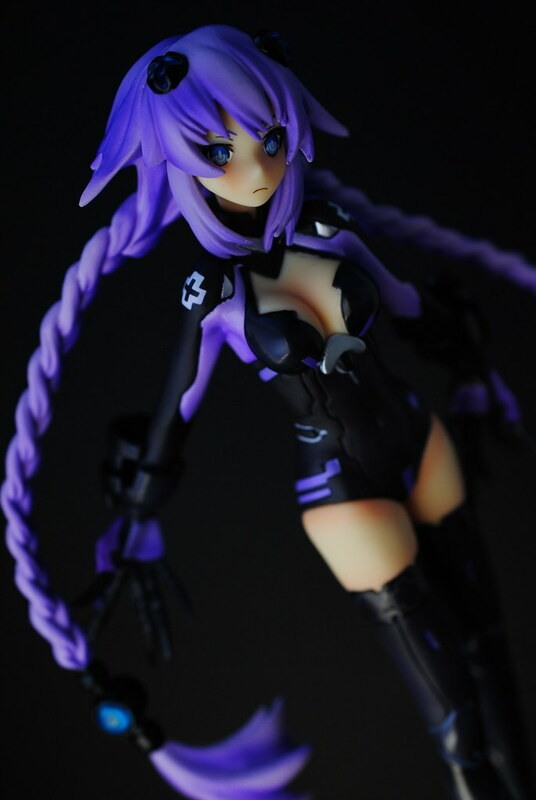 The fourth goddess, Purple Heart, protagonist of the game is a representation of the unreleased Neptune from Sega which would have combined the Genesis/Mega Drive and the 32x into a single console. The countries and their ruling goddesses display traits associated to their console counterparts. 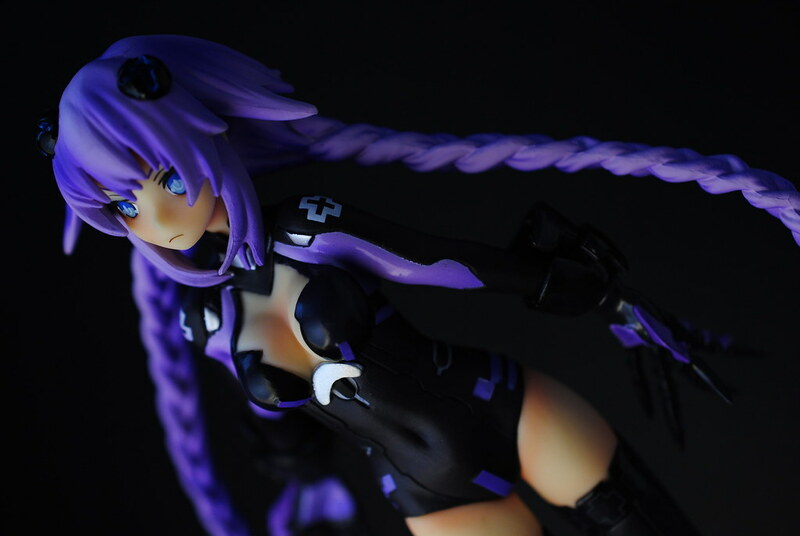 For example you get Black Heart ruler of Lastation, a haughty, slightly arrogant girl who presides over a heavily industrialized country in a seemingly technological arms race against the rest. The game rolls with this and fills the game with nods to the console wars, the gaming industry and a bit of anime. The game is filled with references ranging from things such as Pitfall to current generation stuff like Gears of Wars, then current anime like K-On! and even game developers all but in name. Sadly enough rather than being woven into the storyline of the game plays these out as optional skits featuring character conversations with each other or NPCs or as side quests. 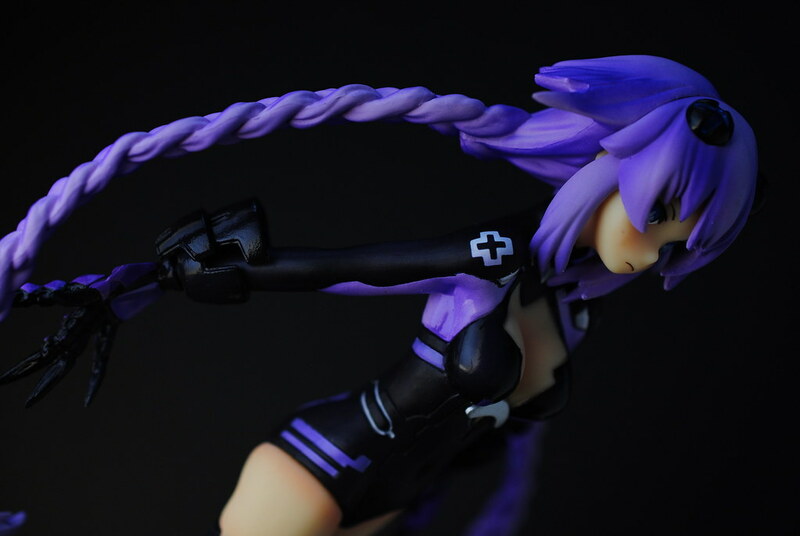 The game gets a jump start when after a long lasting stalemate the three other goddesses gang up on Purple Heart and defeat her in order to change this stalemate. Afterwards she awakens to find herself with amnesia, can now hear the voice of a mysterious girl in captivity that needs rescuing that no one else can, has a flashy transformation into a more powerful form, and sets out on a quest with her newfound allies to save the world because she is an RPG protagonist and that's what they do. 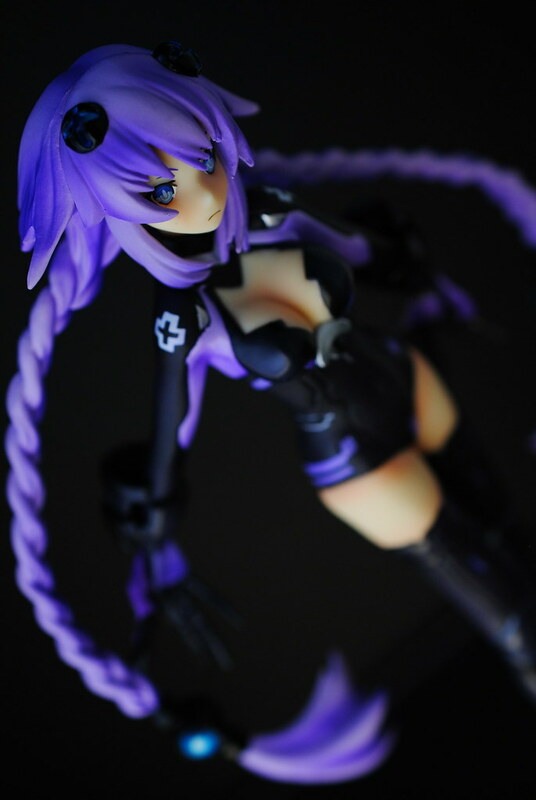 The lovely Neptune is voiced by the equally lovely Rie Tanaka, who actually cosplayed as Purple Heart. She is a rather simple minded, happy go lucky, always positive, somewhat flat chested girl. 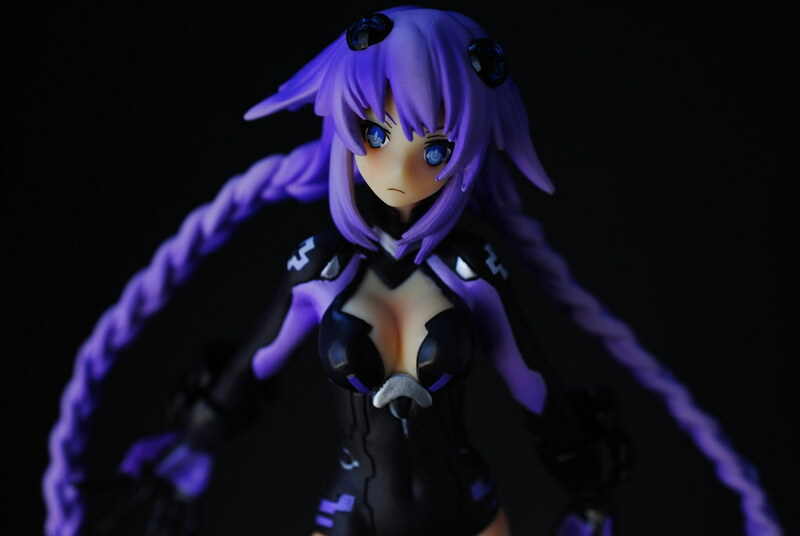 Which is quite jarring when compared to after she transforms into Purple Heart who is a bustier, confident, colder, more prideful and totally not dojiko at all. I think she is a really fun character. Rie Tanaka does an excellent job when she switches between personalities, sometimes it's hard to tell it's the same person doing the voice work. The storyline sequences are presented in a visual novel style dialogue boxes with character portraits. The illustrations are provided by the artist Tsunako whose art style I have come to like after playing the game. Interestingly enough the character portraits breathe, blink and occasionally are bouncy to add some movement to the otherwise usually static character portraits. The actual game part though, is where thing start to get shaky. While the various descriptions and reasoning for the various dungeons that are present in the game are fairly entertaining for both storyline and side quest sequences the dungeons themselves are not. You get the same repetitive dungeons, the lay out may be different but they all share a look and feel that tend to repeat. The same can be said about the objectives it is one of four, find the exit, defeat the boss, find a specific item or defeat a certain number of an enemy type. The game has a nice battle system where you can create your own custom combos and do fairly involved stringing of attacks between characters. However, once you find the one combo that works for you, the one combo that leads to the desired result such as switching characters or the transformations there really isn’t any need to do anything else. This results with the battles consisting of stringing the same combos over and over again. Then you get to the true ending which requires grinding for a game mechanic that is not properly explained within the game. In my case it consisted in doing the same dungeon over and over again until I had grinded enough. I had to do this three times once for each goddess in order to recruit them and unlock the true ending and final boss. All things considered if you can put up with the grinding it is a fun experience that gets more fun given how knowledgeable you are concerning the gaming and anime references. 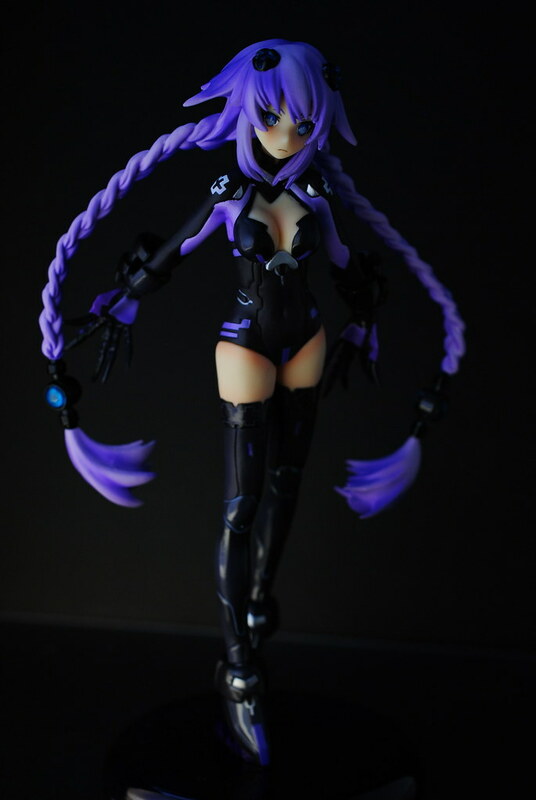 As much as I complained about the game to exilehero I apparently liked it enough that I bought the sequel without much thought, as well as buying this figure of Purple Heart. 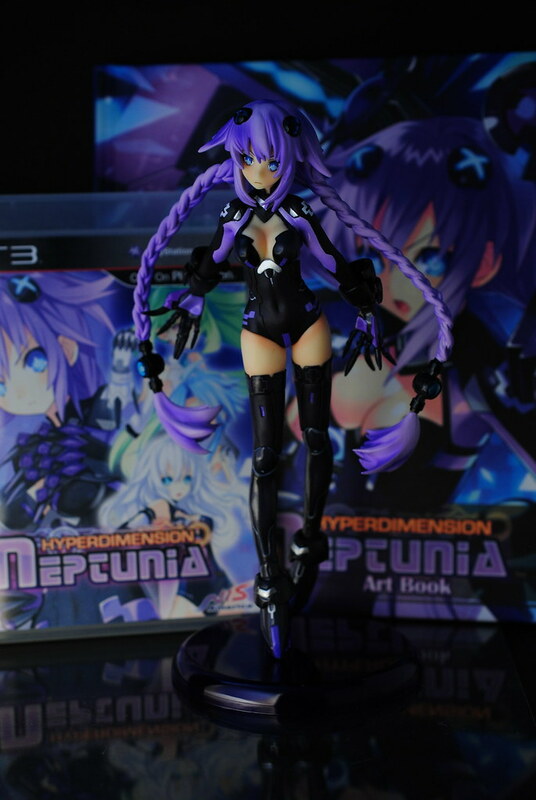 Hyperdimension Neptunia is what I would consider a niche game, the type of property that I would not expect a figure from unless it was in the form of a garage kit. 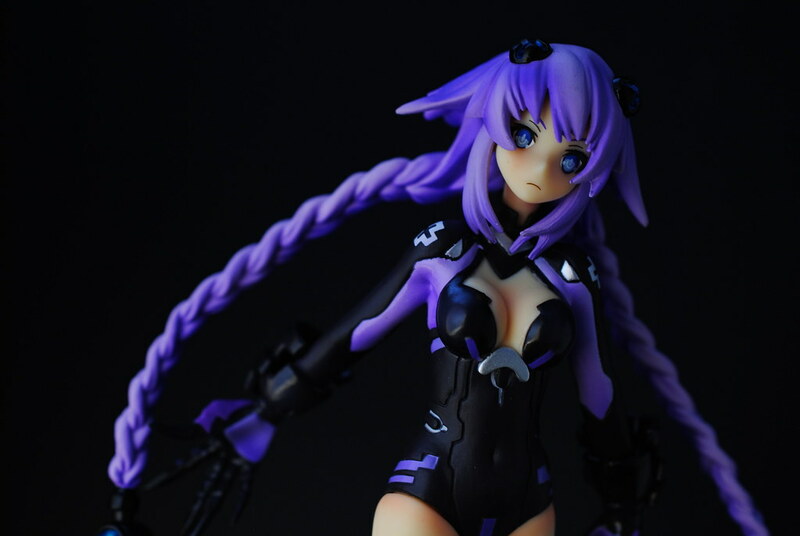 Happily enough for me ques Q went out to prove me wrong by releasing this rendition of Purple Heart. 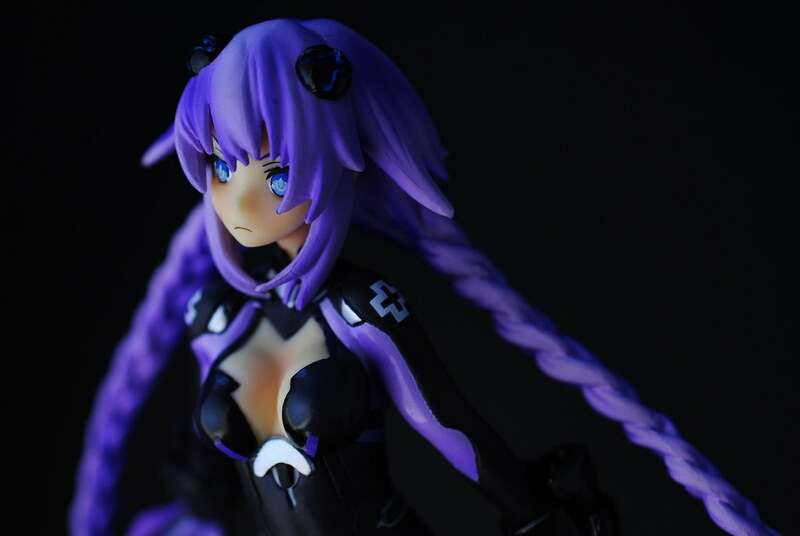 I will express my biggest disappointment first, Purple Heart did not come with her fancy armor parts or weapon. 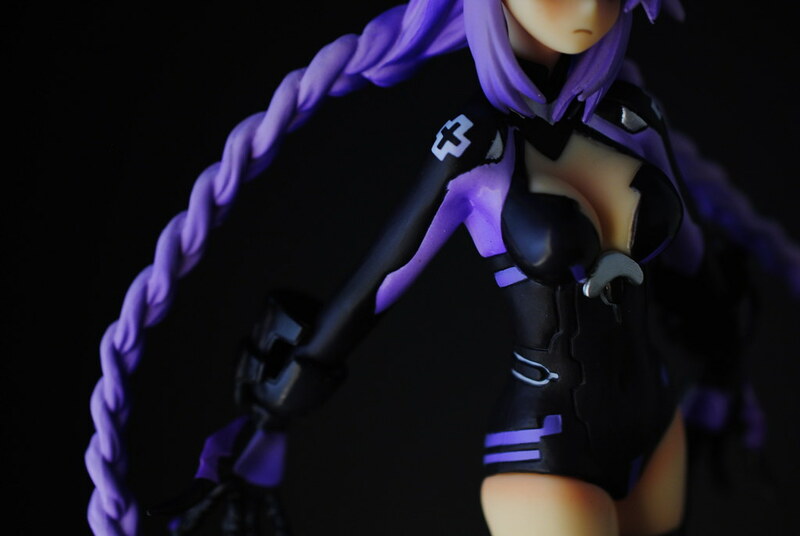 Sure enough, some of the armor is not actually attached to Purple Heart and it just hovers around her but I’m sure that ques Q could have worked something out. 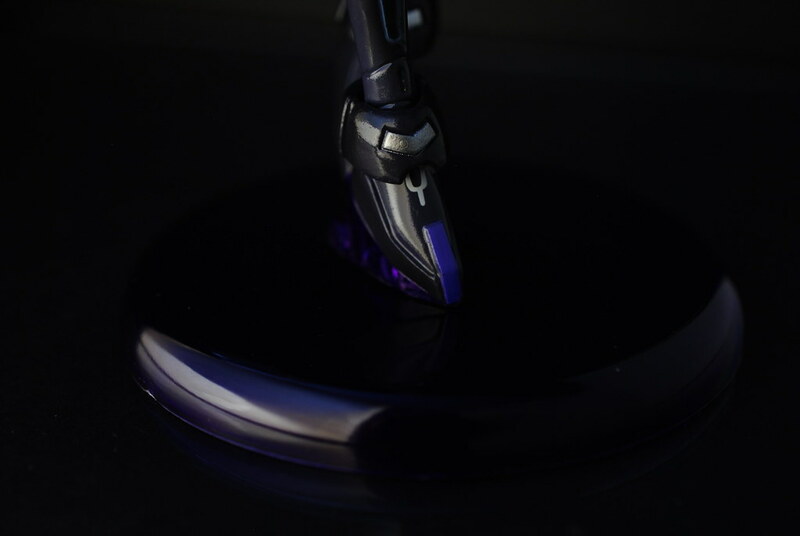 Well, here is one thing that I was pleased with the figure. Certain parts that should be plump are just as I would have liked after playing through the game and looking at the illustrations. 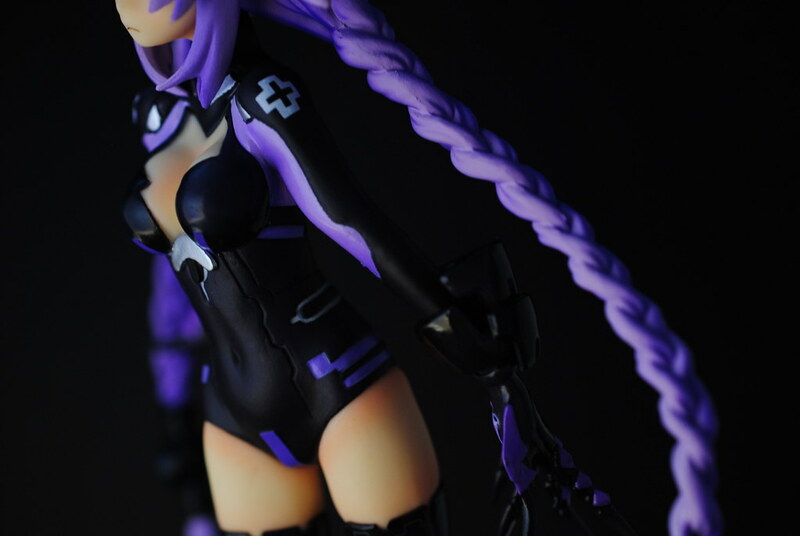 I'm a big fan of the skin tight plug suite like outfit Purple Heart and the other goddesses get after transforming, the figure reflects that nicely. What I am happy with though is the nice sculpting of the body and the body suit. I love how the suit hugs her body at all the right places, lovely! In particular I love how it looks in her nice tushie! I suppose the way it looks reminds me a lot of a one piece swimsuit. Hmm... I do wonder why it has her name on it. Overall this figure is quite decent if only a bit boring. However, once you start to look closer you start to see some literal rough edges here and there. The painting for example while good looking from afar once giving a closer look in some areas does not keep with in the lines. The hair while having a nice two tone purple giving it nice highlights is literally a bit rough. 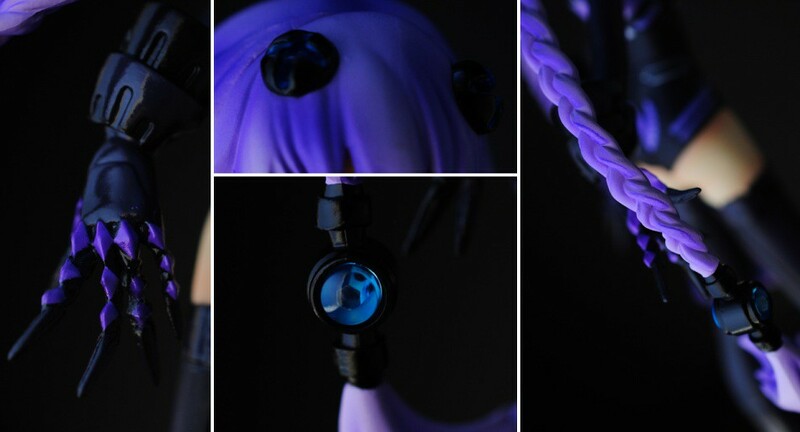 Interestedly enough, her hair adornment holding her braid together can glow like in the game if you shine a light at it. Apparently ques Q though it was important enough to point it out in the box. The base is a bit on the boring side, clear plastic circular base, can't get any more vanilla. Everyone once in a while I see people complain about bases like these, as for me as long it works and is not overly obtrusive I don't really care. I think if I have a problem with this figure it would be the face. The expression is in par with her personality and in game apperance but it is the lack detail that dissapoints me. I'm happy with the eyes, it follows the glowing "on symbol" form the game. There is a lack of detail in the mouth plus her nose lacks definition from some angles so it looks like she doesn't have any depending where you look from. All things considered if you are a fan of the game or character it is a figure for you. Some rough edges around but it is a decent figure all around. Perhaps a bit expensive at 7600 yen for what you get but it has apparently been on sale at several places closer to the 4500 yen mark which is easier to swallow. 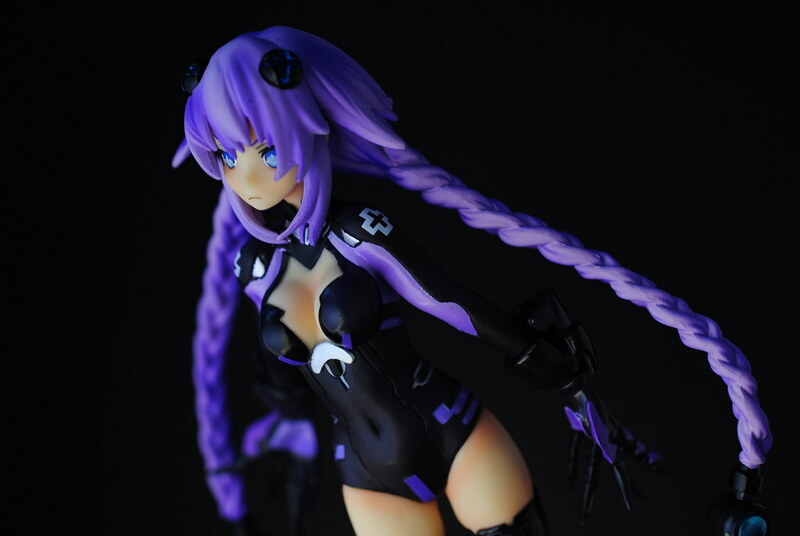 Now, ques Q has had my attention lately because they figures that have shown off look very appealing to me. 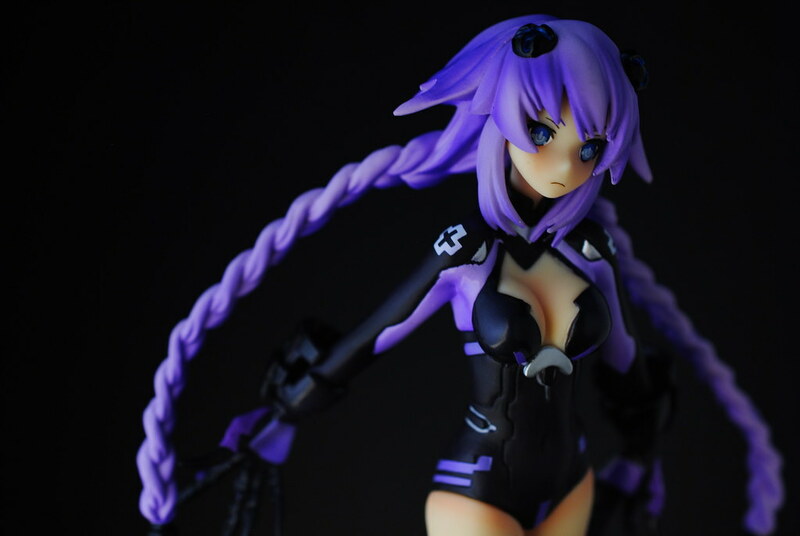 However, after their Yukari from Touhou and now this Purple Heart I’m unsure what to think of them. 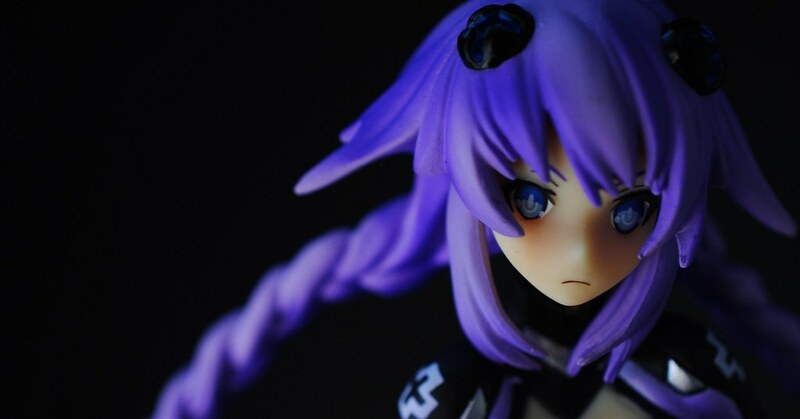 They release figures of characters I like, have a good enough quality, but it’s the prices bothers me. 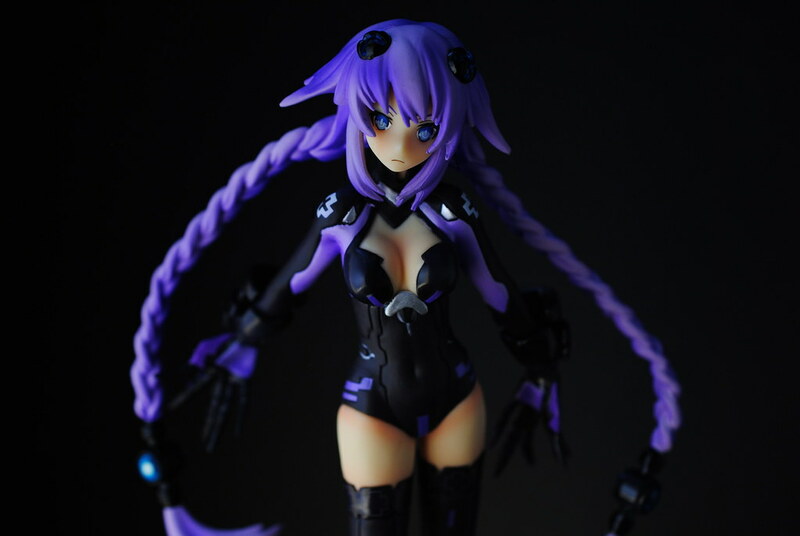 If their prices where some 1000 - 2500 yen cheaper depending on the figure it will just right in my opinion. Well, that's that. Hmm.. this was more about the game than the figure. I guess I'm living up to the gamers part in Otagamers.